Locally Owned and Operated Bee Removal Service in Gold Canyon, AZ. Safe, effective, guaranteed bee and honeycomb removal services. Bee Removal in Gold Canyon has increased just as the population and number of homes have increased over the last ten years. Gold Canyon is a beautiful city tucked away in front of the Superstition Mountains and just far enough away from the everyday hustle and bustle of Phoenix to make the night sky and stars pop. However, with such beauty, we must also share it with the wildlife and that includes our flying insects and of course that includes beneficial insects such as honey bees. Bees love the desert as much as we do and also love swimming pools gardens and flower beds as well. This makes a perfect combination for the bees to settle down and make a home. 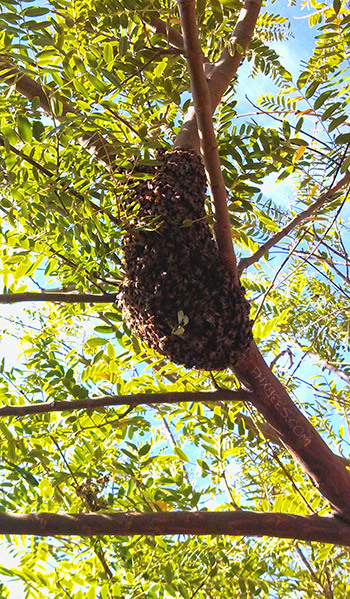 Bee swarms that land on tree limbs when migrating will normally take off within 72 hours. Migrating swarms are docile as long as they are left alone. 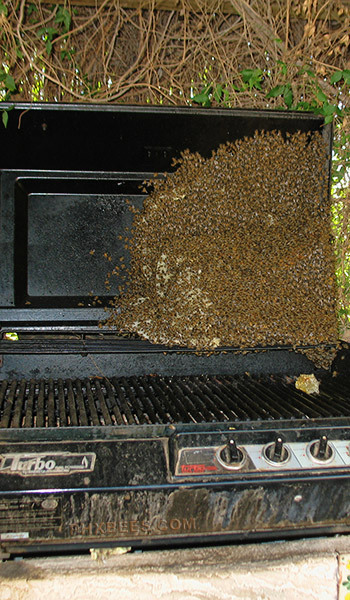 Having a migrating feral bee swarm removed can and will cause unnecessary stress. Letting nature take its course is the best thing you can do to help preserve our bee population in central Arizona and also save yourself some money. Treating or trying to remove an active bee colony can be extremely dangerous. Especially an Africanized honey bee colony or killer bees as they have become known. Everyone within 100 yards of the active bee colony is in danger of being stung and becoming a target for the defending hive. We cannot express how serious this is and how quickly it can get out of hand for someone who is not experienced in the handling of Africanized Honey Bees. We have a lot of seniors in the Gold Canyon community and safety should be of utmost importance when it comes to bee removal. Walls, parapets, attic space, sheds and more, all make great places for bees to start a new hive and start producing honey. Once the bees get started in a wall or attic space it does not take long for things to get out of control. Bees begin setting up honeycomb and have the Queen bee start laying eggs as quickly as possible. Honeycomb will be established to the size of a couple frozen waffles after about 48 hours. The bees will immediately begin stocking up pollen, nectar, and water. The queen will begin laying eggs and the bees will fall into a steady workflow. 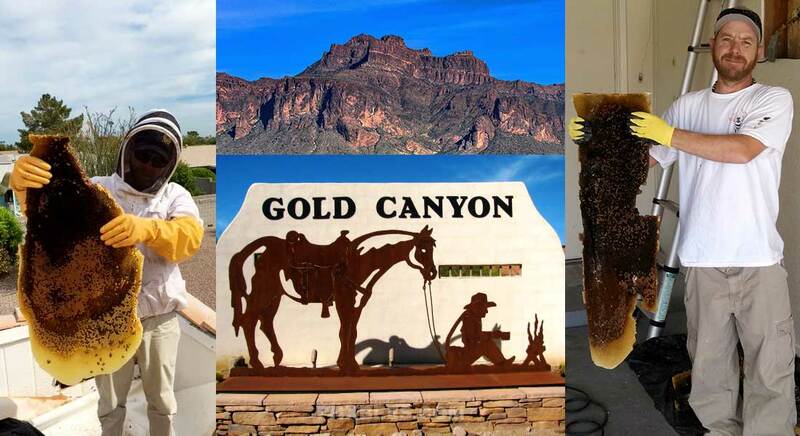 Gold Canyon residents, as well as the surrounding Superstition wilderness, provides the bees with everything they need to survive. After the Bees have been established for awhile they will eventually become defensive of their hive and will let anyone who gets too close know it. This is where the danger begins as well. If they are Africanized Bees they could easily kill a pet or even a person. As soon as bees are noticed on a property you should call and set up an appointment to have the bees safely taking care of. If the bees have been there for a few days then the honeycomb will need to be cut out and the area sanitized and sealed off properly to prevent another infestation of bees. We have been safely removing bees in Gold Canyon AZ for over a decade and will continue for years to come. Most of the hives we encounter in Gold Canyon are very aggressive and can be dangerous. This is usually the case with bees out in rural areas of central Arizona. Please give us a call and get some advice on your bee problem and we will be glad to answer any questions you may have.